You can create Restore Points in Windows in a number of ways. Every time you install new software, Windows automatically creates a new Restore Point. You can also manually create Restore Points in Windows. Click on the Start Button, type Create a Restore Point, switch to the Settings filter on Windows 8.0, and then hit Enter. The System Properties System Protection tab will be shown. 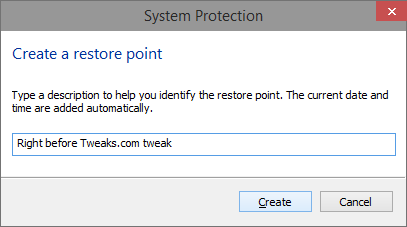 Click the Create button near the bottom of the window to manually create a restore point. On the next screen, type in a name for your Restore Point and click Create. After you click the Create button, the Restore Point immediately begins taking a snapshot of your system. A progress screen displays and notifies you when the snapshot is complete. In my experience, it takes only a few minutes to create a Restore Point. Click on the Start Button, type in rstrui.exe, and hit Enter. After the System Restore utility has loaded, you can select the recommended restore point that will undo the most recent change or select from a list. Select Chose a different restore point and hit Next. You will now see a list with the date, time, and a description of each Restore Point. Find the Restore Point that you want to revert to, select it, and click Next. Check the confirmation page, and then click Finish. Click Yes on the final confirmation screen. Your computer will now log you off and start the System Restore process. When it finishes, your computer will restart. 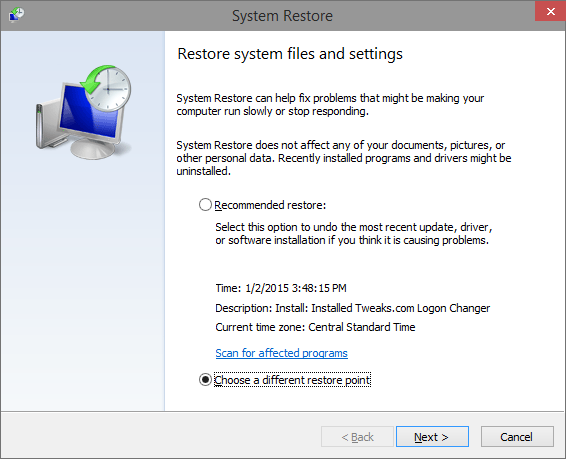 One of the best parts of System Restore is that you can always undo the recent restore if restoring your computer did not solve your problem or created new problems. 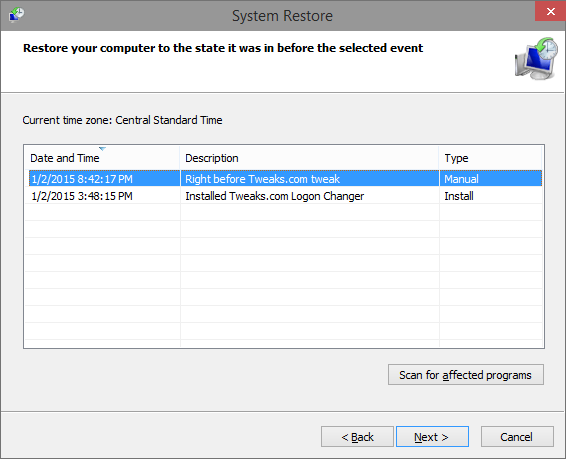 You can undo the recent restore by starting up System Restore again. 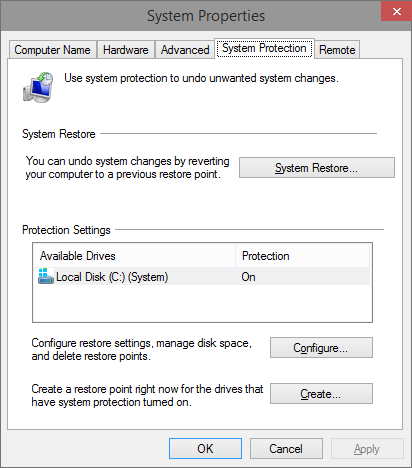 After you complete any restore, the Undo option is displayed on the opening screen of the System Restore utility.